THE First Flight Wind Community Liaison Team took to the road in recent weeks to visit primary and secondary schools, from Downpatrick to Dundrum, Newcastle to Kilkeel, to introduce the offshore wind project plans for just off the County Down coast to staff and pupils alike, and listen to their views. 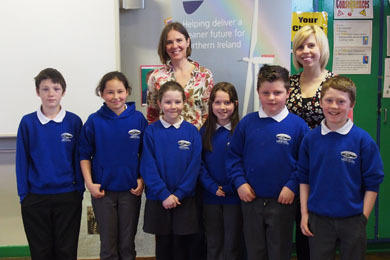 Pupils from Newcastle Primary School with Sacha Workman, First Flight Wind education officer, and class teacher Ms Donaldson after talking about wind energy and offshore wind. Flight Wind has focussed on delivering an informative Education Programme which complements the curriculum and can be easily adopted by teachers. Importantly, this education programme has been designed to explain how renewable energy can benefit young peoples’ lives and the communities they live in. The First Flight Wind Education Programme was launched at Brackenagh West Primary School in Kilkeel in April, and was followed with visits to Kilkeel Primary School and St Colman’s and Grange Primary in Kilkeel. The Community Liaison Team also visited Sacred Heart Primary in Dundrum, Newcastle Primary, St Marys Primary Annalong, Kilbroney Integrated Primary and Down High Prep. First Flight Wind also visited local secondary schools, hoping that by involving, informing and inspiring the students, they will potentially consider making a career out of this growing sector. The Community Liaison Team met students from Kilkeel High School, also De La Salle and St Mary’s High Schools in Downpatrick, concluding this Education Programme with a project presentation to Down High. Around 600 pupils attended the presentations and made good use of the opportunity to ask the First Flight Wind team lots of interesting questions. 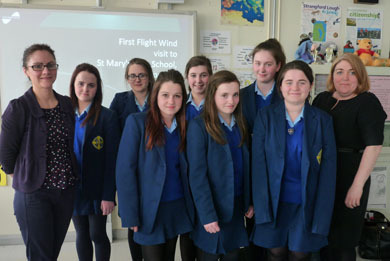 Sinead Maquire of First Flight Wind with teacher Catherine Brown and pupils from St Mary’s HIgh School in Downpatrick. Victoria McCabe, Flight Flight Wind Community Liaison Team said: “This Education Programme has been a great success. We’ve been impressed with the students’ knowledge of renewable energy at both a primary and secondary level; they are already well informed about many of the issues and they have drawn upon their knowledge to ask us a lot of challenging questions!”. 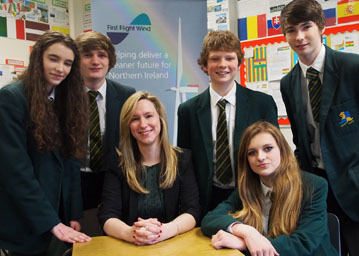 Victoria McCabe of First Flight Wind with geography pupils from Down High School. The Community Liaison Team addressed the students’ questions, which touched on topics such as the potential size of the offshore wind farm, its location, the ongoing community consultation work with key stakeholders, especially the local fishing industry and all the environmental survey work that needs to be completed over the next few years before a planning application is made. For any schools that would be interested in learning more about the offshore wind project, First Flight Wind will be writing to schools in June to invite them to attend a morning session at our Information Days in September 2013. The information days will host a series of ‘story boards’ on the project where students and teachers can view pictures and ask questions about the project. 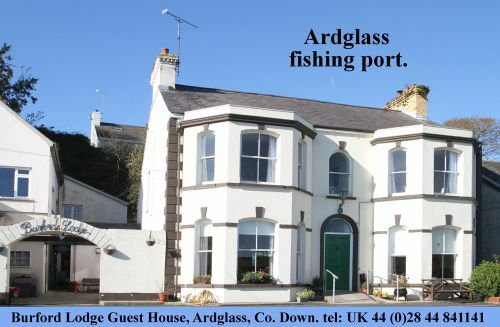 In the meantime, please feel free to contact us at info@firstflightwind.com or ring 028 9042 3165 for more information. (First Flight Wind is a consortium comprising B9 Energy, DONG Energy and RES).